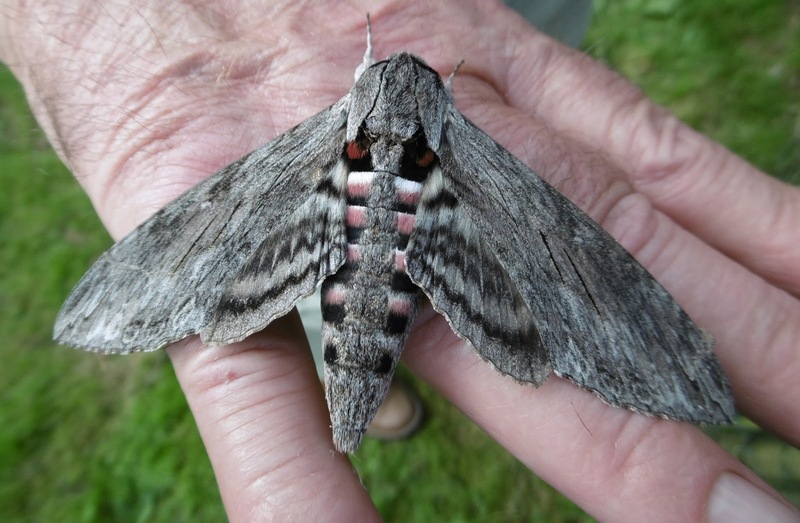 I thought that today was bound to be an anticlimax after yesterday's excitements over the Convolvulus Hawk moth. I suppose it is, but less so than if I only had my recent arrival the Dark Swordgrass to show you. 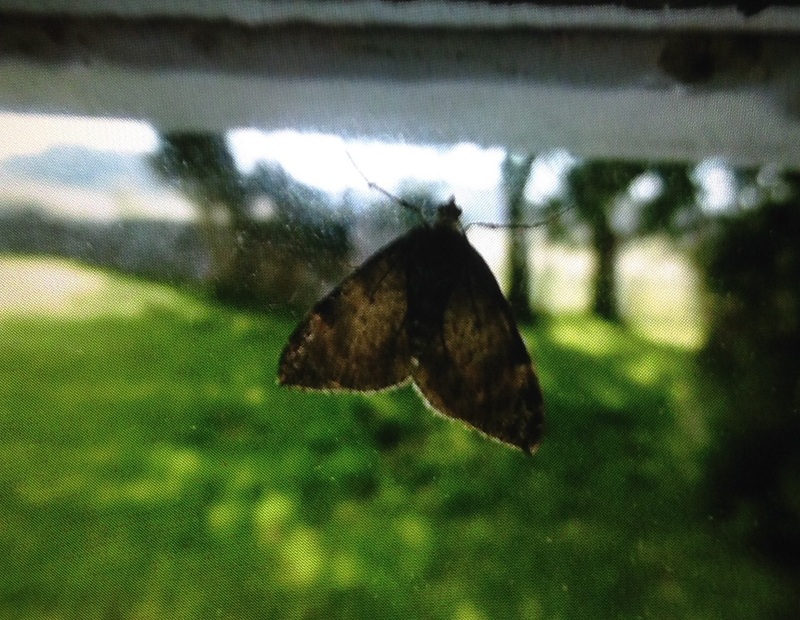 Although this is an interesting creature, as a sturdily-built immigrant which arrives from Europe all the year round in modest numbers, it has the brown, grey and black livery which is so common but hardly eye-catching among moths. Not so the unexpected gift to the blog from my talented artist niece Rosie, described in a magazine review of her year's graduation show at Glasgow School of Art as a 'visual powerhouse.' She has Tweeted me the picture above of an exotic passenger on the Colonsay ferry, which she took back to the mainland a week after Penny and I had travelled the same way. 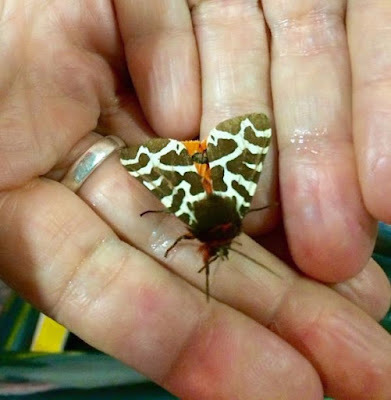 It is a Garden Tiger, one of three moths honoured by appearing on the cover of the Moth Bible and a favourite for illustrations in children's books because of its bright colours. Interestingly, its pattern of blotches varies as much between individuals as our human fingerprints, to the extent that no two are exactly alike. I am glad that it is a customer of CalMac ferries because since the 1980s its numbers have decreased nationwide, possibly because of crop-spraying (its famous 'Woolly Bear' caterpillars favour weeds) or more likely because the UK seems to be in a weather cycle of wet Januarys followed by cold Februarys. The Woolly Bear is also familiar to doctors. One of my very nice uncles was a dermatologist who had a wide knowledge of plants and animals because of their role as skin irritants. He would set the minds of patients at rest, when they came to him with frightening rashes, by teasing out recent encounters with, for example, Giant Hogweed, or indeed Woolly Bears. The Dark Swordgrass, by contrast, continues to flourish thanks to its pioneering enthusiasm for flying as far and as far as it can. Migrants usually do well in all animal species, as the ones with the get-up-and-go. This one is helped by its rakish appearance, long and powerful wings which are held tightly folded when the moth is at rest, in the manner of a missile rather than a jet. Not too its little black dagger mark which, to me, adds a sense of purpose. 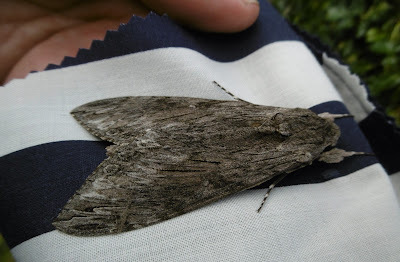 I was going to tell you about an interesting if familiar migrant moth this morning, the Dark Swordgrass, but something much more amazing has come up. Confirming her reputation as the Top Spotter of moths outside the trap, Penny nudged me at a lovely family wedding in Cornwall yesterday and said: "Is that a moth over there?" What she had spotted was an isoceles triangular shape as big as a bird - pic above - quietly resting on a piece of bunting strung along a hedge. 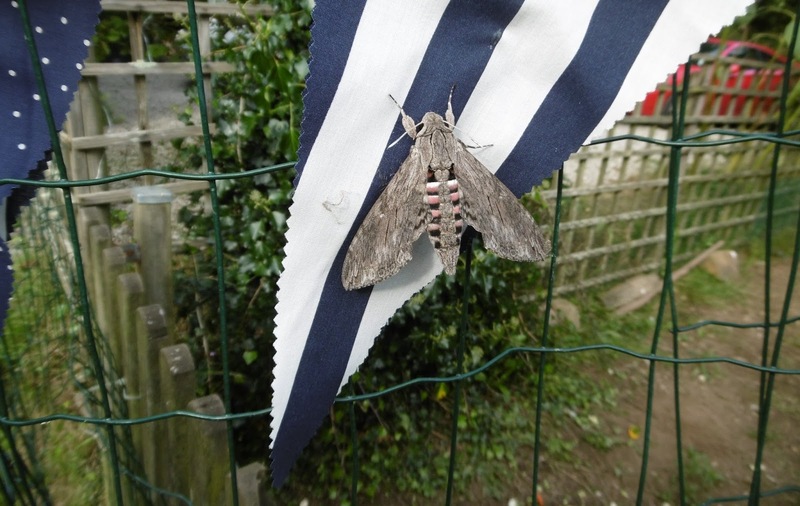 Her discovery turned an already idyllic occasion into something unforgettable, because this was a Convolvulus Hawk moth. 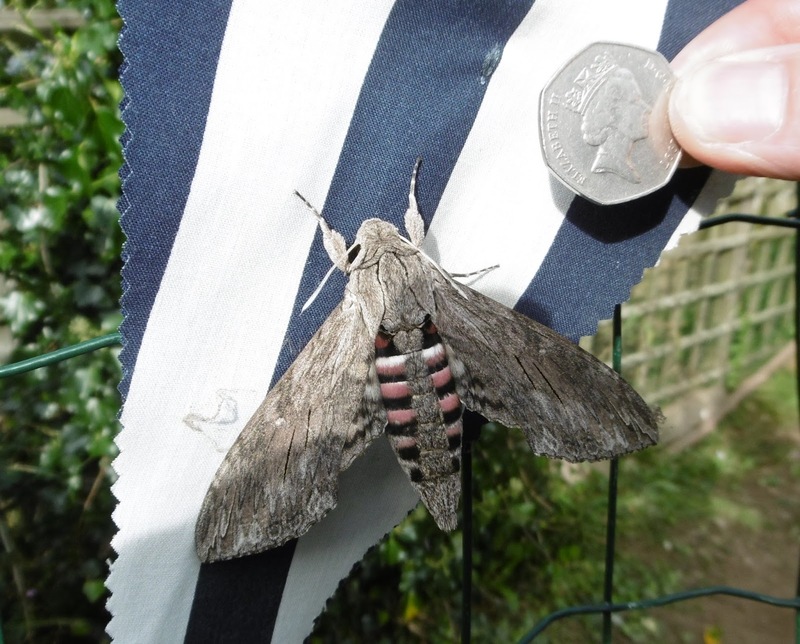 Second in size in the UK only to the Death's Head Hawk (famously seen in these parts at Kirtlington last year), the moth is also a migrant and one which - like its human equivalents who are so much in the news and our thoughts at the moment - overcomes many obstacles to travel vast distances. It is a native of Africa and mostly stays there, but some fly to southern Europe earlier in the year and manage to breed. In turn, some of their offspring venture further north but that is the end of their story. Their caterpillars cannot survive our winters, even mild ones. We have plenty of convolvulus, the familiar gardener-taxing bindweed which the larvae love, but it is too cold. 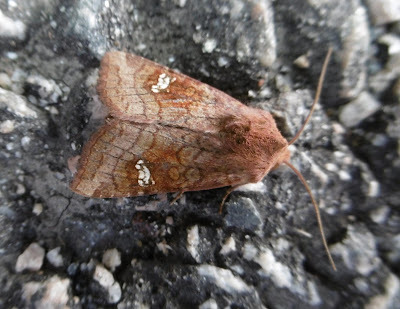 The adult moth is rarely found here but coastal counties such as Cornwall come up with a few sightings every year, and Penny's now joins them. 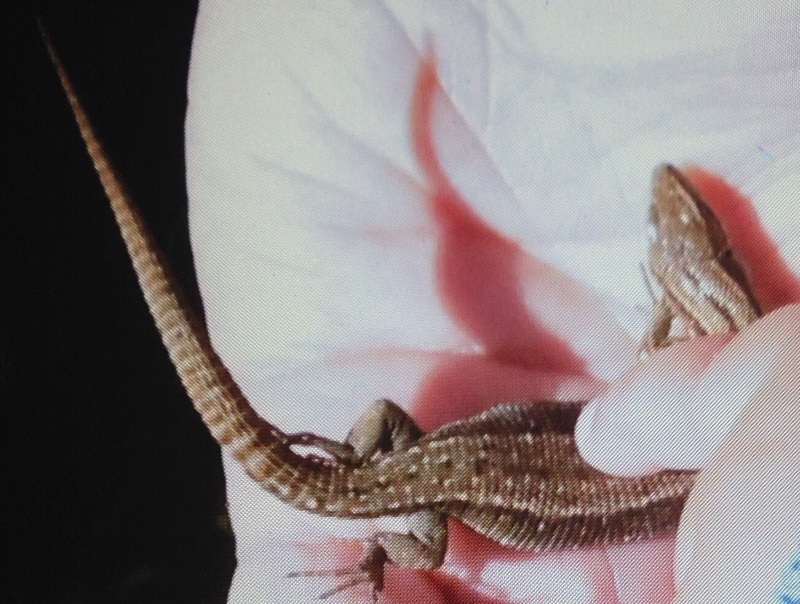 I have never seen one in the UK before but did enjoy trying to catch them in the Italian Adriatic village of Numana when I was a teenager on holiday. They were flying round the streetlights and a local bar lent me a stepladder. I got a good look but they were too cunning for me to net. It was great, incidentally, that a cousin with whom I used to hunt butterflies when we were boys was also at the wedding. It's his hand in the third picture, above, which shows the moth at its best. 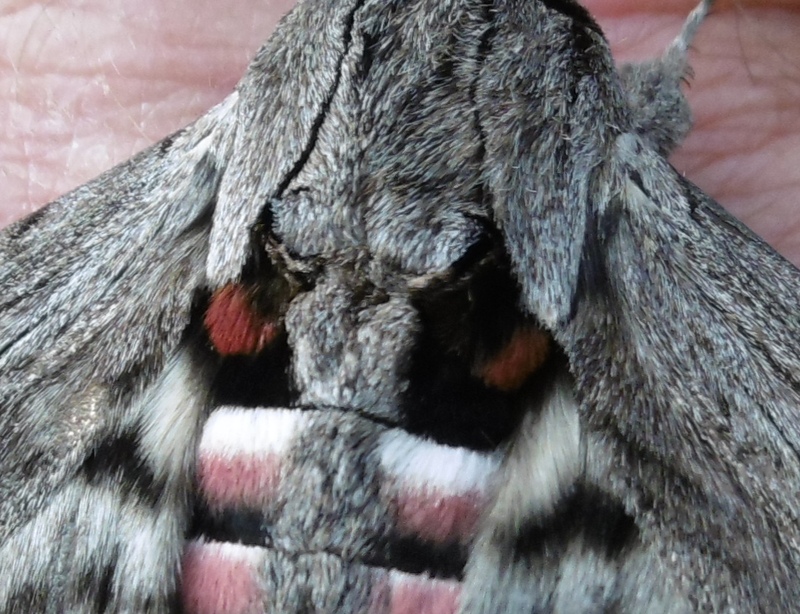 The moth's dominant grey camouflage is a lovely mixture of greys and its pink-banded body, revealed when scared of a predator, has two deep crimson 'eyes' high up near the thorax. We did a bit of gentle tickling to persuade it to show these which retain their 'eye' effect even when the wings are only slightly open, as in the second (and sorry, slightly blurry) picture of the two above. 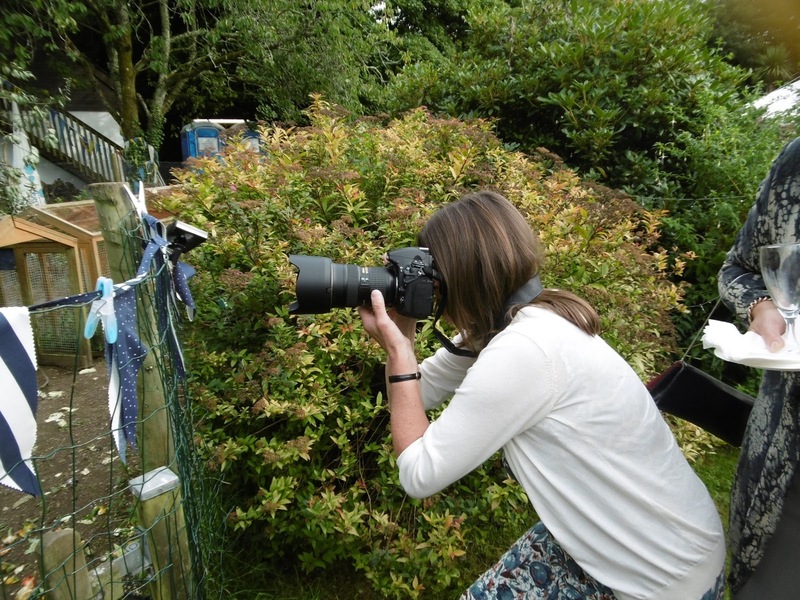 Luckily the moth was extremely sleepy and almost everyone at the sunny garden reception got to have a good look and the chance of a photograph, including the official recorder of the happy day, below. The only sight we missed was the insect nectaring. It has the longest proboscis of any moth found in the UK and so can refresh itself inside deep-throated flowers such as tobacco plants which few others can reach. 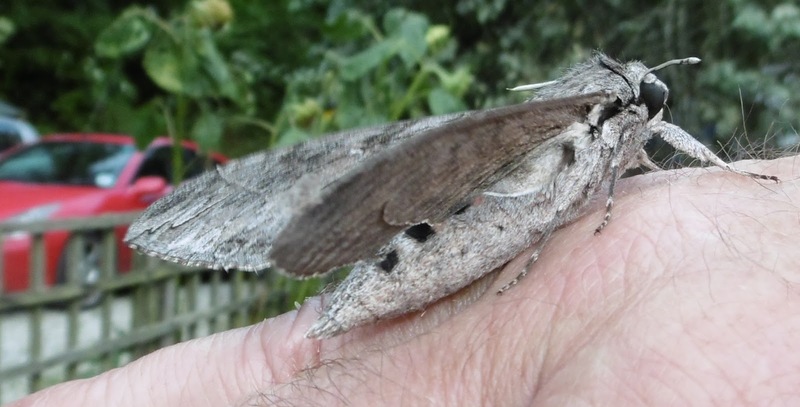 I can be confident of my unoriginally punning headline, btw, because this moth has the 'quieter', less marbled grey topwings of a female Convolvulus Hawk and smaller antennae than the male. As I hastily explained to the bride and groom, what I was really excited about was their lovely day and obvious, great happiness. But the moth came a close second. I promised to return to the subject of the Ear Moth found in my granddaughter's buggy on Colonsay, and here I am, doing so. Warning: I do so at some length. 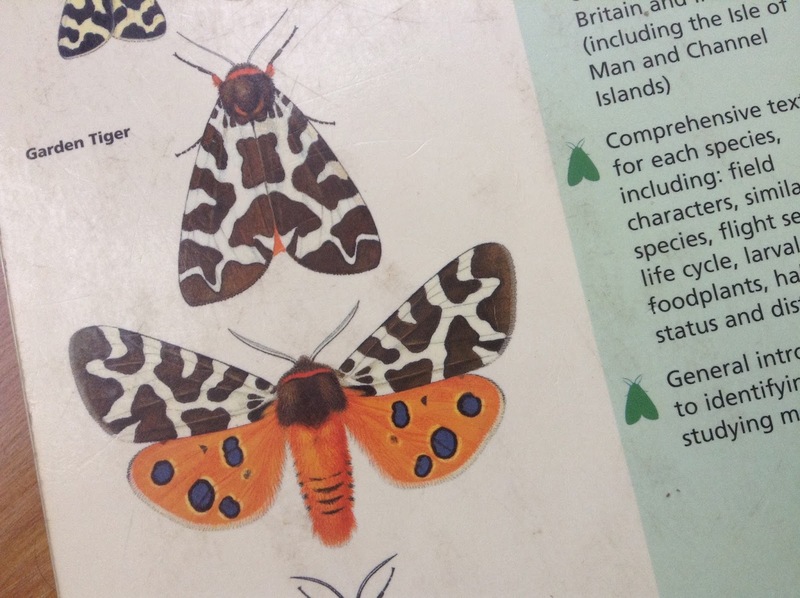 I've found it interesting, especially as it led me to an online version, hosted by Butterfly Conservation, of a superb but out-of-print book on identifying difficult UK macromoths. Faithful readers do not need telling about my deficiencies in this department; and reading about the differences between the four types of Ear - standard, Large, Crinan and Saltern - does not fill me with optimism about my chances of improving. This is partly because to be absolutely sure of an Ear's ID, there is no alternative to killing and dissecting the insect. That is the only way to see the minute differences in the genitalia which incontrovertibly tell them apart. Here they are, below, in Richard Lewington's brilliant paintings in the Moth Bible. They presented him with an impossible challenge; although they look slightly different on the page, the range and variety of colours and patterns found in all four makes the notion of a 'type' specimen for any of them idle. The online book is more encouraging about other similar species which cause me grief, so I can say genuinely: I will try harder. 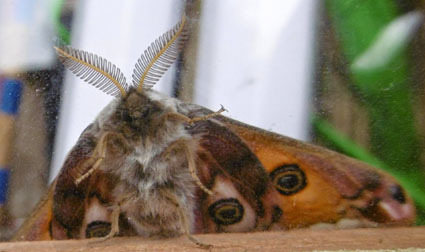 My Ear question is however insoluable; all four species are found in the Hebrides and my actual moth is hundreds of miles away on Colonsay and safe from dissection (although the chances are that it is inside the tummy of a bat or bird). The fact that the four different species have been teased apart is a tribute to human curiosity and it intrigued me to know who came across the differences in a moth which the great Linnaeus classified simply as Amphipoea oculea, the standard Ear, in the 1760s. 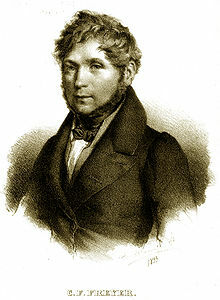 The Large and Saltern Ears were named by the German entomologist Christian Friedrich Freyer (1794-1885) who has a great many eponymous insects including Freyer's Fritillary and Freyer's Pug. 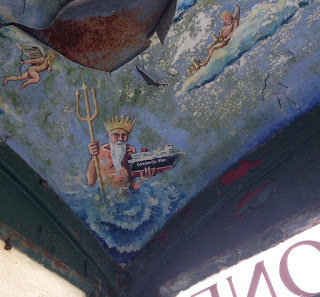 He looks a cheery soul - see Wikipedia picture left. The Crinan followed almost a century later, thanks to Rev Charles Rich Nelson Burrows, vicar of Mucking in Essex from 1897 to 1933. I was discussing these complex matters over early morning tea with Penny this morning and she said: "It was probably all down to one of those 19th century vicars with not much else to do." You can see why I married her. Crinan, meanwhile. is a village in Argyll and 'saltern' refers to seawater pools left to evaporate for the salt they contain. 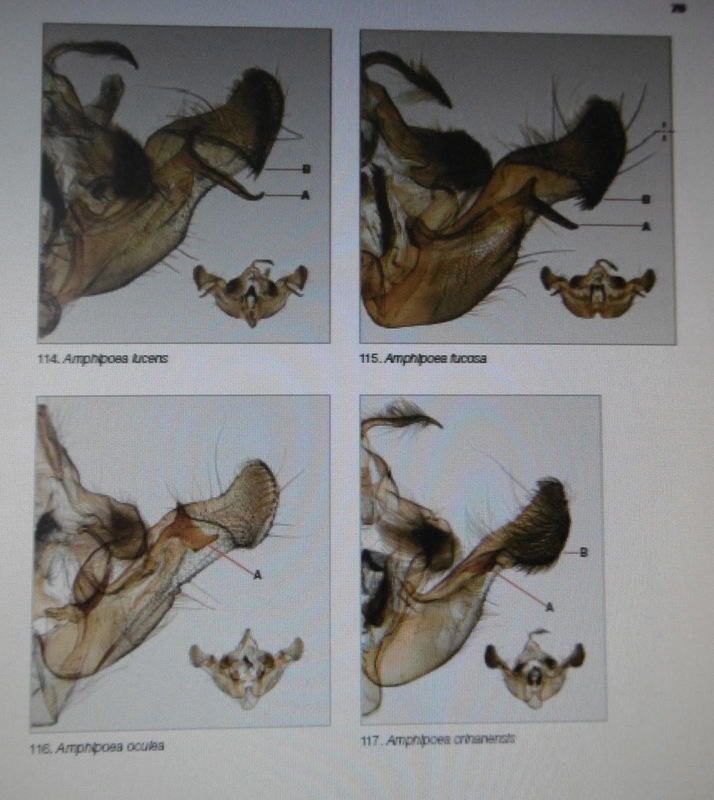 To add further complications, there is a sub-species paludis of the Saltern Ear, discovered by the great Victorian entomologist William Tutt, and there are areas in western Scotland where the Large and Saltern Ears have hybridised and specimens found with what are un-nervingly called 'intermediate genitalia'. For your delectation and to tempt you to visit Butterfly Conservation's online site, here is a screenshot of the four different sets of 'bits'. A final question which occurred to me relates to the scientific names of the four. They all share the 1820s coining of Amphipoea, meaning 'both or two' of something - I'm not yet sure what. 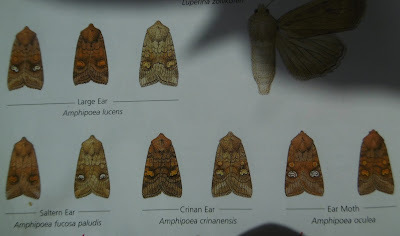 Their second names are oculea (eye-like) for the standard Ear Moth, lucens (shining) for the Large Ear, fucosa (beautified) for the Saltern and crinanensis (from Crinan) for the Crinan. Paludis means 'of the swamp or marsh'. Perhaps the second and third of these refer to aspects of the moths' genitalia but if so, I do not see it myself. The issue of killing moths, which most enthusiasts used to do before the invention of today's excellent digital cameras, came up via a brief return to journalism which I undertook while away. My old employer the Guardian emailed, asking me to write a Comment piece on the suggestion from Butterfly Conservation that moth-trapping has become the UK's fastest-growing natural history hobby. Hooray, if so. I was a bit reluctant, being on holiday, but the call of the moth proved too strong, so I got up early and bashed it out. Things were made slightly more dramatic by my iPad's failure to save the article twice, on each occasion when I'd almost finished it but had to check something. But luckily my memory cells still work. If interested, you can read it here. The thread of readers' views repays reading, as usual, and I was interested in the level of concern about not killing things. I share this, although there is little or no sentiment shown in the daily slaughterhouse which is the world of wild creatures. But this, admittedly rather long, essay on the Ears maybe shows why it sometimes has to be done. 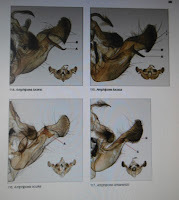 Just to round off my Scottish holiday, which has dominated the blog of late, here are a final bunch of pictures and a brief discursion on the genitalia of the Ear Moth. The first picture, as you will have detected, is not of moths but seals, those cuddly creatures which do so much, along with Beatrix Potter books, to anthropomorphise the animal world with not altogether helpful results. Such is the power of modern cameras, even small digital compacts like mine, that this photograph revealed something I couldn't even begin to spot with my - admittedly ageing - eyes. All I could see, from about a quarter of a mile away as dusk , were some just discernable shapes on the distant rocks, possibly a tad lighter than the rocks themselves. The first photo is zoomed in and the second zoomed even more. Then there were Colonsay's wildflowers. I have already gushed about the harebells, thyme and tormentil on the sheep-graze, grassy pastures behind the dunes, but there were also rarer treasurers such as the orchids above and below. 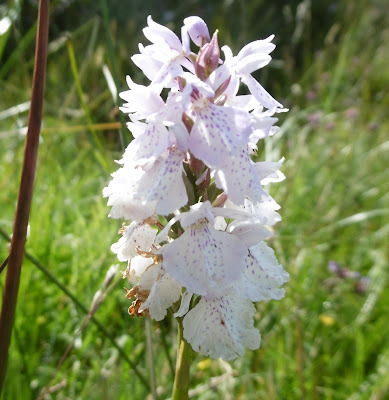 I think they are Heath Spotted Orchids but please correct me if you know better. Finally, not moths but seashells. The beaches were covered with lines of these at tidemarks, beautiful little things in all manner of colours and shapes. We spent a happy afternoon looking for the little pink cowries which wash ashore from time to time. Here is our haul. Yippee, we're back home at last. But no trapping last night as the first rain which Penny and I had encountered for ten days was dripping quietly down on Oxfordshire. 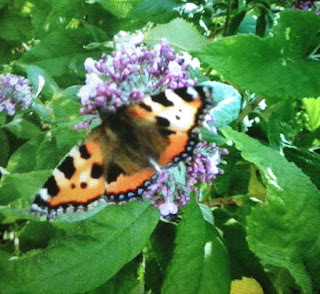 That gives me a breathing space to revise the butterflies and moths encountered on our lovely, sunny spell in Scotland. 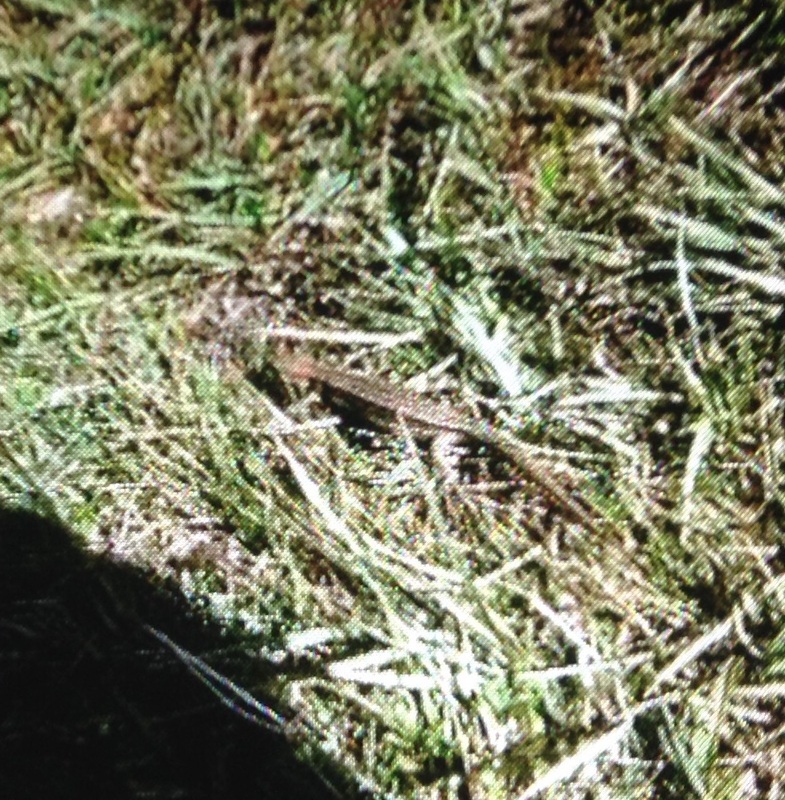 Some of the pics are 'proper' versions of my gimcrack efforts at combining the camera playback screen with the wobbly iPad while away; the others are insects which I've not shown in my on-safari posts. 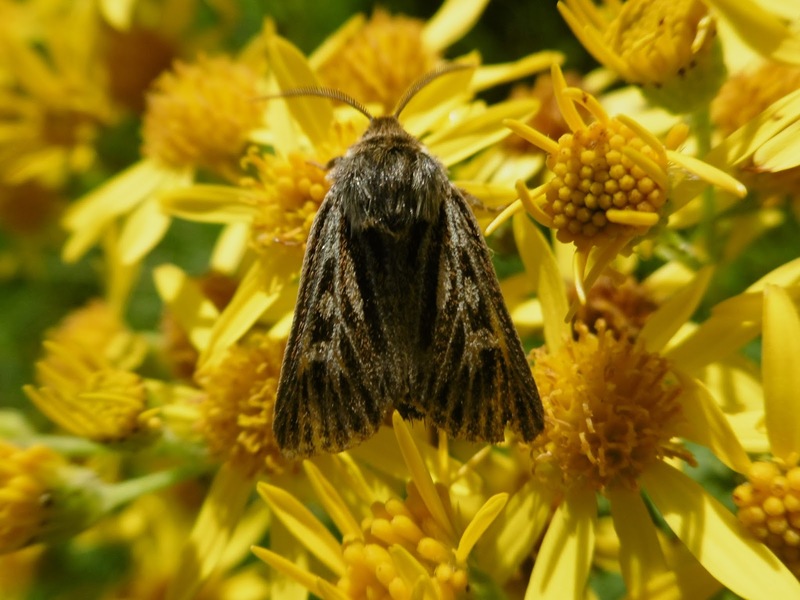 The one at the top is in the latter category, an Antler moth nectaring on the blaze of sunny glory which is ragwort, one of my favourite wildflowers even if it is in theory a notifiable weed. We didn't ring up Perth police to report its presence up by the radio masts above the motorway. I think they already know. Next come some Browns, variously photographed on Colonsay at near Lairg in Sutherland, which interest me. 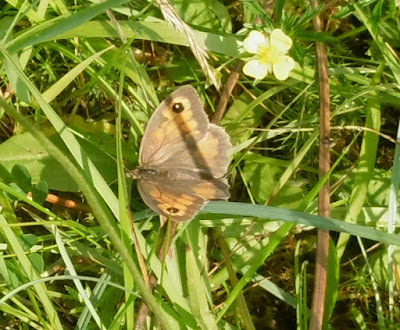 I think the bottom three are Meadow Browns, but is the first tone, with the double spots on the forewings, a Scotch Argus? I hope so, as this is a butterfly which I have not previously, knowingly seen. Next, I was pleased to find myself among a busy colony of Wall butterflies which were very loyal to a beautiful patch of grassy meadow behind the sand dunes on the south east coast of Colonsay, overlooking the junior islet of Oronsay and the famous Paps of Jura, suggestive peaks which rise much higher than any of the other local island terrain. 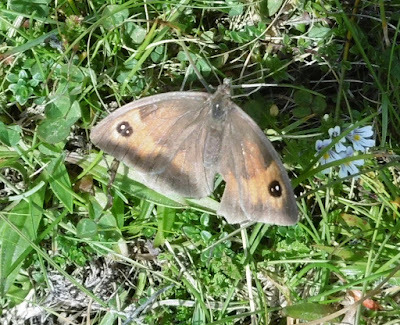 I wrongly thought that I had found a Wall butterfly in our garden last month, when I was compiling my 20-strong list of common local species. I corrected myself after reading of the Wall's preference for coastal areas. Colonsay exactly fits its bill. Now for some Common Blues, a butterfly which perhaps deserves a grander name. Common or not, they are lovely creatures, flying version of the harebells which also throng Colonsay's coasts. The pictures below show two males and a female, the latter with darker colouring but still a beautiful dusting around her body of the trademark vivid blue. On an early walk to a beach, I spotted a very raggedy Common Blue - the first of our holiday and so I took a picture. I'm glad that i did because on the return journey, there it was again, further proof of the way that many individual butterflies stick to their 'patch', behaviour less common in moths. ...and on the way back. And finally for today, a moth which I mentioned in a holiday post but did not show: a Buff Ermine found dead in our cottage. A lovely moth, even when life has left it. The trap and I will be reunited this evening when P and I, and a very large bag of laundry, finally make landfall back in Oxfordshire after a wonderful foray to bonny Scotland. 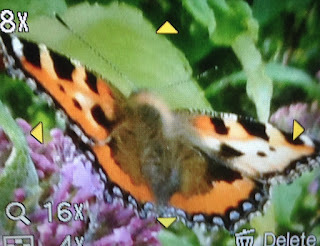 Our furthest north was Overscaig on Loch Shinn where I had the pleasure of encountering what I think is one of the 105 recorded aberrations of the familiar Small Tortoiseshell Butterfly, sipping nectar from a buddleia in the sunshine which - amazingly - accompanied us almost throughout our ten day trip. I think that this is a variant of aberration Lutea, one of the best-known, with some of the usual vivid orange, as shown on the standard butterfly in my palm, replaced by a less showy buff. 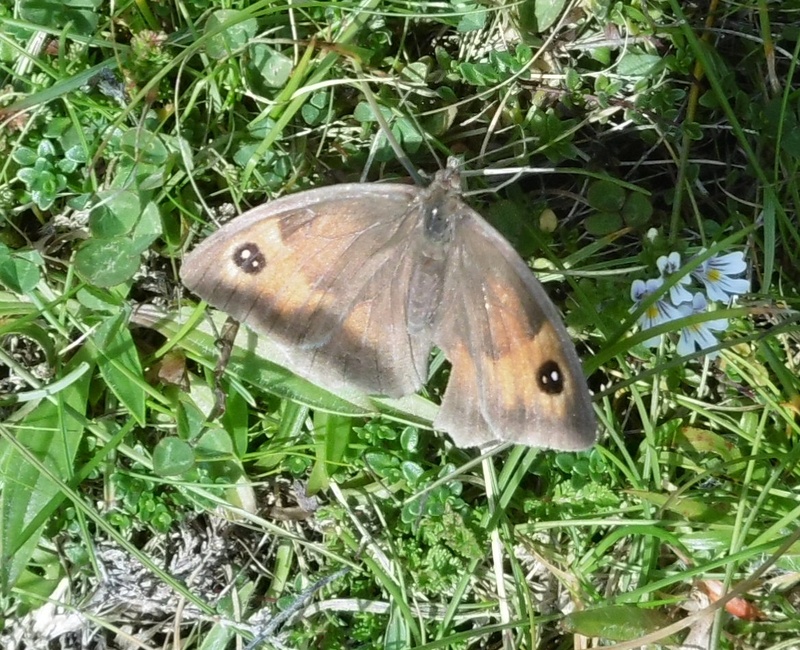 This is thought to occur genetically unlike the more striking aberrations of the ST, involving larger black areas and very rarely an entirely melanic butterfly, which are reckoned to follow the experience of extreme heat or cold - a very late heavy frost for example - when the insect is just at the stage of pupation. More moths tomorrow - and then a bumper supplement of better quality pictures than the iPad snaps of the camera screen which have been all that I could offer on safari. Was made by John Macbrayne"
but the one to Colonsay went wrong yesterday and so here we are still on the island. But the sun is shining, so we're not complaining. And the episode led to the discovery of a moth. 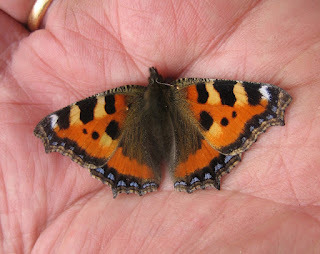 It's the one shown above, which fluttered from my grandchild's folded buggy when a friend hoicked it out of the boot of our car. I think it's a Common or Lesser Common Rustic although it looks possibly a bit more exciting than that; but my Moth Bible is stashed away in a suitcase until tonight so we will all have to be patient until then. Update: See Comments. It's one of the four Ear moths. But which? More on this soon. It's my fourth moth from Colonsay which isn't too bad, given that I haven't got the trap. 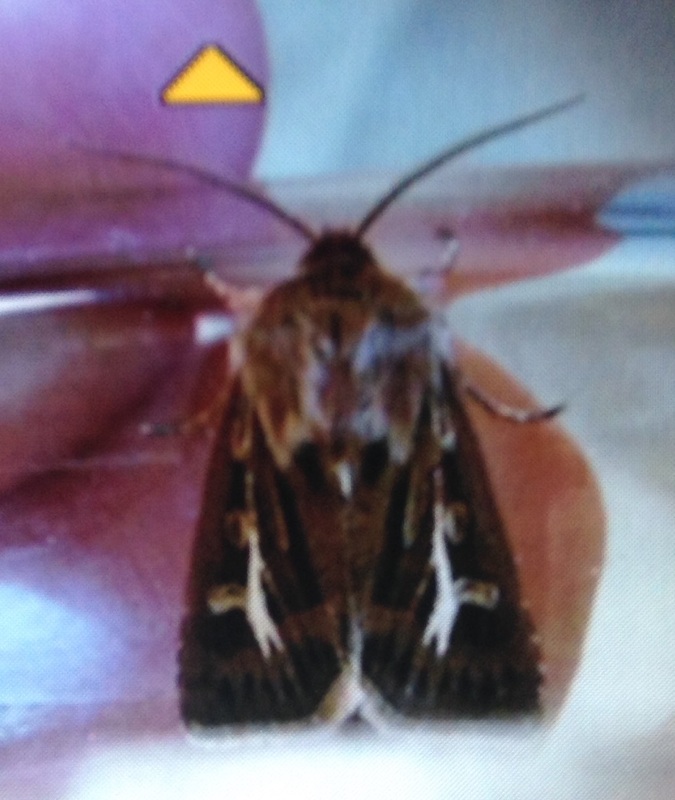 The first was the Antler Moth in my second picture, which came to the porch light of the cottage where we are staying. 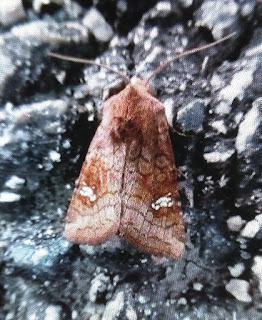 The second was the Carpetty subject of my third picture and the third was a Buff Ermine which I found, sadly expired, on our kitchen windowsill. Yesterday's Dark Green Fritillary remains the entomological highlight of our week on this lovely island, along with jewel-like Common Blues which dart around the coastal pastures. 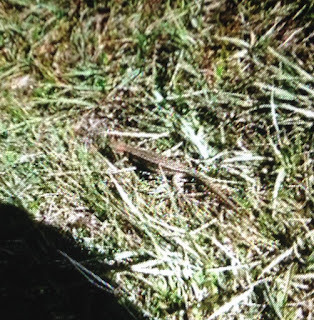 But we also had the happiness of finding this lizard which sat docile - or petrified - in Penny's palm while our granddaughter stroked it and started singing 'Ee-AyEe-Ay-O' , the chorus of Old Macdonald which is currently her response to all wild animals.